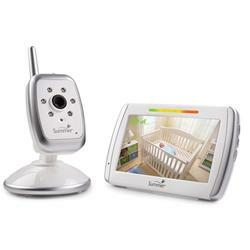 Wide View Lens Technology enables parents to see more of the babys room with the wide angle lens camera and large 5" color flat-screen monitor. Monitor comes with rechargeable batteries for handheld portability and has a 600-ft range. Two-way communication allows parents to talk to baby or each in the nursery for added convenience.